165/365(+1), a photo by Luca Rossini on Flickr. Today the adventure begun. We left the hotel early in the morning, when a thick and smokey fog was still covering the island, waiting for the sun to eventually dissolve it with it warm rays. We were heading to the heart of Kodiak National Wildlife Refuge, “the last frontier”, a place still ruled by grizzlies and bald eagles. And since there are no roads at all crossing the park, the only way to reach the wilderness is to fly into it. With no roads comes no airports. Kodiak is full of lakes and placid rivers, so float planes are the main and most effective transportation means in the island. I had never flown on a small plane, let alone a float plane, so at first I was a bit scared. 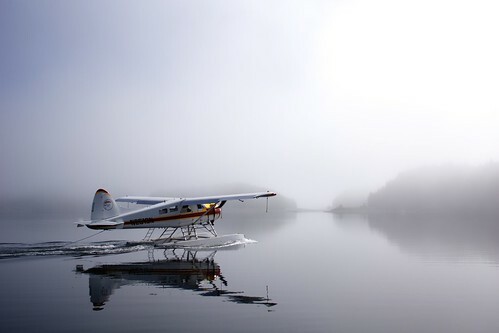 When we arrived at the “airport”, that is, the lake closest to Kodiak town, the fog was still quite thick. The planes looked like immersed in a limbo, floating over a mysterious surface of smokey water. But immediately after we took off, the plane cut through the fog and the majestic show of the Alaskan aerial scenery opened before ours very eyes. It was an incredible flight, the landscape was so rich and powerful, we even spotted several bears fishing salmons in the rivers. Now we are at the lake cabin. We set things up, fished the whole afternoon to catch some dinner, started a fire, grilled the fish on it, and finally spent the evening around the flames, savoring the beginning of our adventure into the wild. this is my favorite shot of yours.